Curated shopping is the next big trend in the online shopping industry. Big fashion brands, e-commerce retailers, affiliate marketers, bloggers, freelancers, and influencers are making use of curated shopping pages and selling only the best stuff out of the plethora of shopping options available today on the market. But what exactly is curated shopping? Is it just another internet buzzword? Or is it going to revolutionize the way customers search and buy products online? Let’s get into the details of what and why of curated shopping and how you can too, create a curated shopping product page and start selling yourself! If you already know everything about curated shopping and you can’t wait to create a curated collection of products for yourself, jump straight here. Online shopping is huge. As smartphones become cheaper and the internet becomes more and more accessible, online shopping is one area experiencing massive growth and turnover. People are spending more time and money getting their favorite products at the click of a button. Check out these stats if you don’t believe us! Customer preference to online shopping has given birth to retail giants like Amazon, Alibaba, eBay etc. E-commerce company’s work tirelessly to provide as many buying options and products to customers as possible. This allows customers with varied styles and preferences to find something they love. However, this plethora of options leads to a phenomenon known as the “paradox of choice“. As consumers, we always feel that having many choices improves decision making and helps us decide which one’s the best product or service that suits our needs perfectly. However, having too many choices at your disposal is not always a good thing. The phenomenon of too many choices was examined scientifically in American psychologist Barry Schwartz 2004 book, ‘The Paradox of Choice.’ In the book, Schwartz states that having too many options leaves us feeling depressed and isolated, as we become overly concerned with our potentially missed opportunities. Schwartz further adds that removing, rather than adding to, consumer choices actually improves ones’ happiness. Customers can be more happy with their choices if they are presented with a streamlined selection of the best-matched products, as opposed to how happy they might have been had they chosen a different product altogether. Online shopping, too, creates a paradox of choice amongst consumers and can be a bit overwhelming. No matter if you are looking to buy a furniture for your living room or a plain white t-shirt, there are literally hundreds of websites, thousands of brands, and millions of products to choose from. This abundance of choice delays decision making and often leads to anxiety, dissatisfaction, and regret. Online shopping thus, needs an overhaul and should work towards making the process of selecting and buying for consumers, a lot easier and streamlined than it is today. In such a scenario, online shoppers will only be shown products based on their acute preferences and taste, tailored specially to take care of their needs and wants. This will not only save consumers time browsing the sites mindlessly looking for “the” product but also speed up the decision-making process tremendously. One way of doing this is by curated shopping. Before we go into curated shopping, let’s first get the basics out of the way. Curation describes the act of finding, organizing and sharing the best and most relevant content on a specific topic with your audience. Thus, curated shopping involves finding the best of the best products, services, and goods in shopping industry and compiling it in one place. Curated shopping is really picking up steam in the online shopping space – Amazon, Wish, and mainstream fashion brands. They are all jumping on this trend to bring a more personalized and streamlined shopping experience. Online Shoppers prefer curated experiences because they help them filter out the overwhelming amount of content available down to manageable collections of products. The biggest reason why curated shopping works is that it provides customers with choices that will most interest her. These can be done depending on his/her previous interactions, shopping choices, preferences, style etc. Since these curated shopping experiences are created by real people, it tends to a more authentic, personalized and more importantly, influential on purchase behavior. HOW CAN I LEVERAGE CURATED SHOPPING FOR MY BLOG? Curated shopping is turning out to be an extremely powerful strategy for bloggers, freelancers, and brands to influence customers by providing a human touch and reducing the workload on their end. If you want to take advantage of this amazing opportunity, you should definitely start creating a curated list of products and help your customers make a purchase decision quickly and easily. Once you have gone through this tiring process, you have to go on and add each product individually to your website by dealing with messy HTML tags and embed code. However, there’s a much easy way to curate and sell products without having to go into so much trouble with developers, design, and coding. What if I told you there’s an app that automatically creates an awesome looking, mobile responsive and SEO friendly curated product page for you by just adding links to the products to it. This is exactly what elink.io is all about! elink.io is a web app that allows anyone to create beautiful looking curated shopping collections in less than 5 minutes! That’s right! In less than 5 minutes, you can create a collection of products, embed it on your website, and start selling amazing products to your audiences. Intrigued? Let’s get right into the steps of creating an awesome looking curated shopping list in under 5 minutes! 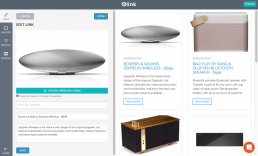 elink.io works by letting users choose a curated shopping template and simply adding the links to the content they want to showcase- fashion accessories, dresses, shoes, tech gadgets, furniture etc- basically anything on the web with a link! The best part? You can switch between elink’ 19 different and beautiful templates anytime you want and preview and test each one to see which one fits your design needs. All the templates are responsive and look perfect on all devices. 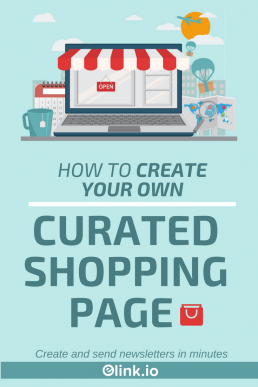 Let’s dive into these 5 simple steps of curating and creating a shopping collection. elink has a variety of visually appealing templates to choose from. Each template is responsive, so you don’t have to worry about the appearance of your video on different devices with varying screen sizes. The best part is, you are not stuck with your product page layout. Come back at any time even and give it a new look. Even after it has already been published! Copy the links to various products you want to add to your product page and paste them into the template one by one. elink.io automatically makes the link visual by giving it an image and a short description. Step 4: Personalize your page! Embed the elink product page on your website or blog. Send your product page elink as an email newsletter to your fans and followers. In the world of online shopping, the agony of choice is real. Anything that works towards simplifying the shopping experience and easing the stress of having to choose among thousands of product choices is bound to get the upper hand. Curated shopping saves consumer’s time and effort and at the same time, reduces the stress of having to go through what seems like an infinite stream of products. It provides a streamlined and more personalized shopping experience for shoppers by showing a list of products based exclusively on their taste, preference, order history or simply the best of the best. With elink.io, it’s extremely easy to get started with curated shopping and start earning revenue through affiliate marketing. You don’t even need to have a website or blog, you can simply share an elink web page through your Facebook, Twitter, Pinterest, Instagram any other social media channel or even share your collection as an awesome looking email newsletter! So what do you think about curated shopping? Are you ready to bring back the fun in shopping for your audiences? Let’s have a chat in the comments!